Solarbotics is a Calgary based company that has been providing electronics, kits, and BEAM Robotics to customers for over 20 years. For nearly two decades, through several iterations, they utilized in-house resources to create a proprietary E-commerce website with the intention of providing their customers with an artisan experience. Unfortunately, as a result of the aging code-base, changes and updates to the site became more challenging, along with support and maintenance costs growing with time. Looking to solve this problem and provide their customers with a fresher user experience they reached out to Zyris. Zyris designed and developed a customized WordPress and WooCommerce theme along with a range of other custom functionality to provide them with a platform that will serve their customers for years to come. The legacy proprietary E-commerce platform that was a culmination of over two decades of updates and iterations resulted in an aging code-base that made the addition or updating of functionality challenging in addition to requiring increased support and maintenance costs. Zyris worked closely with Solarbotics to design and develop a customized E-Commerce solution using industry leading technology that not only provided their customers with a fresher user experience but also reduced support and maintenance costs. Zyris also provided data entry services to allow Solarbotics to hit the ground running with their new E-commerce website. As a result of the new E-commerce website developed by Zyris, Solarbotics has been able to resume using internal resources to expand their websites functionality in a cost effective and stable manner, as well as refresh their brand through a fresher user experience. Solarbotics Ltd. has had a presence on the Internet since the early 1990’s at the beginning of the era of ecommerce. Our initial four iterations of hand-crafted “artisanal” websites allowed us to create a tailored ecommerce experience, but cost us regarding ongoing maintenance, legacy issues, and security concerns. It was time to migrate our platform to one allowing better management of our growing web presence. Zyris was suggested to us as a firm that would produce a solution for us at very professional level. Zyris was very capable laying out a development process to ensure what we reviewed and signed-off on was developed and delivered in a timely manner. 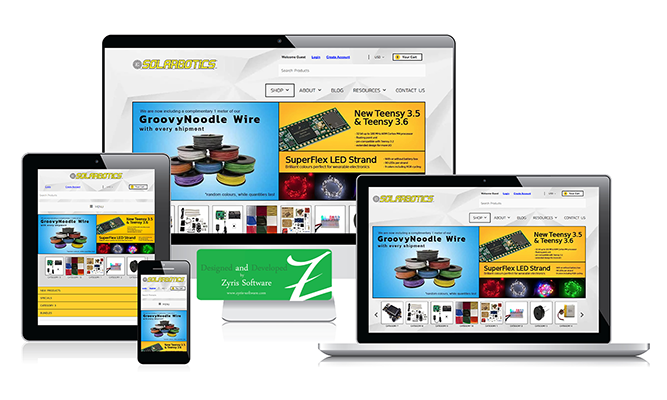 We are very pleased to receive our new WordPress/Woocommerce platform so we can continue refining solarbotics.com to better serve the DIY electronics & robotics community.